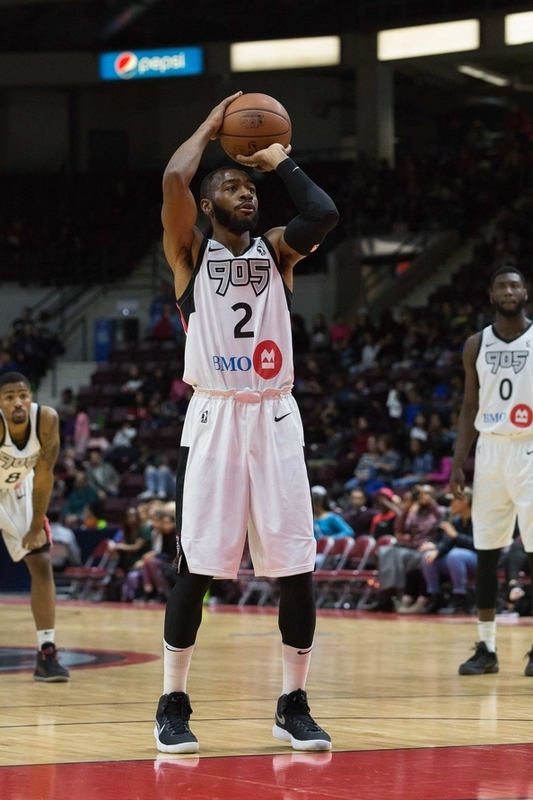 The chants had started for Raptors 905 point guard Kaza Keane in the locker room while being interviewed postgame after a 111-100 win against the Texas Legends (7-9) at the Hershey Centre, and it came from former U SPORTS rival and now teammate Aaron Best. “Kaza, Kaza, Kaza,” Best chanted in a whisper. It’s safe to say those chants were warranted, especially after finishing one rebound shy of a triple double and setting a franchise record in assists. 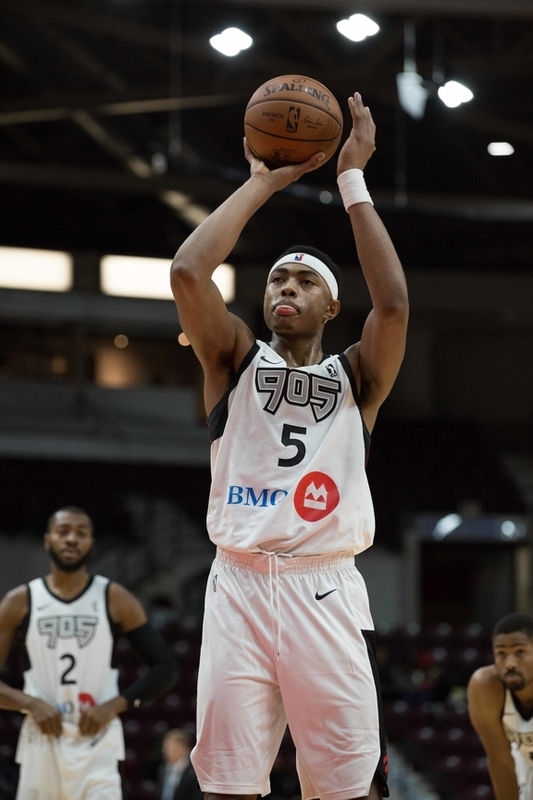 Keane finished with 13 points, nine rebounds and 15 assists, as the Raptors 905 dished out 31 assists for the game, their second highest total of the season. The All-Canadian starting backcourt of Keane and Best combined for 23 points, 16 rebounds and 18 assists and each finished with a +20. Best finished with 10 points and seven rebounds. “The best defender that we have on the team is Best. He’s just always in the right spot, always doing the right things,” Stackhouse said. The win also snapped a four game losing streak for the 905 (5-9). They used a 27-17 edge in the fourth quarter to pull away and overcome a discrepancy from the free throw line (19-10) and foul trouble (22-13). “I thought we couldn’t play without fouling them in the first half but in the second half, we got our hands back and contested hard and did a much better job,” Stackhouse said. The Raptors 905 were looking for any sort of offensive rhythm, averaging just 96.3 ppg. on the season. They sure did find an offensive rhythm as they shot 50 per cent from the field and hit 11 triples. The 905 also outpaced the Legends in rebounding (55-37), points in the paint (64-44), second chance points (22-7), and limited Texas to just 39.6 per cent shooting from the floor. Bruno Caboclo led all scorers with 24 points, 17 of them coming in the second half despite early foul trouble. He also finished with a team high 10 rebounds. “I thought he was active defensively and was active on the offensive boards, rebounding for us,” Stackhouse said. Miller had 18 while Kennedy Meeks had 12 and Shevon Thompson scored in double figures in his fifth straight appearance, with 11 off the bench. Jameel Warney led Texas with 22 points while Kyle Collinsworth finished one assist shy of a triple double with 17 points, 10 rebounds, and nine assists. Leading G-League scorer Justin Dentmon had 16 points but made only five out of 14 shots from the field. Foul trouble reared its ugly head for Caboclo and Thompson as they each picked up two fouls in the first quarter. With Caboclo on the bench and the 905 up 17-13, the Legends went on a 16-9 run to close the quarter as they took a 29-26 lead after one. Caboclo led the 905 with seven points in the opening stanza while Dentmon led all scorers with 10 in the quarter. 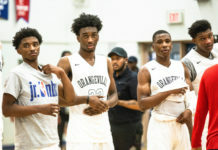 The Legends went up 35-28 early before Kuran Iverson led a 16-5 run for the 905 to take a 44-40 lead, scoring six points in the process as he kept offensive possessions alive with his energy on the floor. But Texas responded, pulling off 13 straight points to take their largest lead of the game at nine (53-44) before Keane spearheaded a 10-5 run with a triple and a layup to close out the half. Texas went into intermission, up 58-54. The Legends made 11 free throws compared to the 905’s one in the first half as the Raptors committed seven more fouls (12-5). Ashley led three Legends players in double figures with 13 points on three triples at the half, meanwhile, Keane had 13 points and a game high seven assists after two quarters. 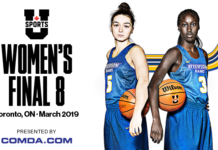 Miller and Caboclo both came out red hot out of halftime as the 905 burst out on a 23-8 run to take the largest lead of the game at the time at 77-66, after a triple from Best. 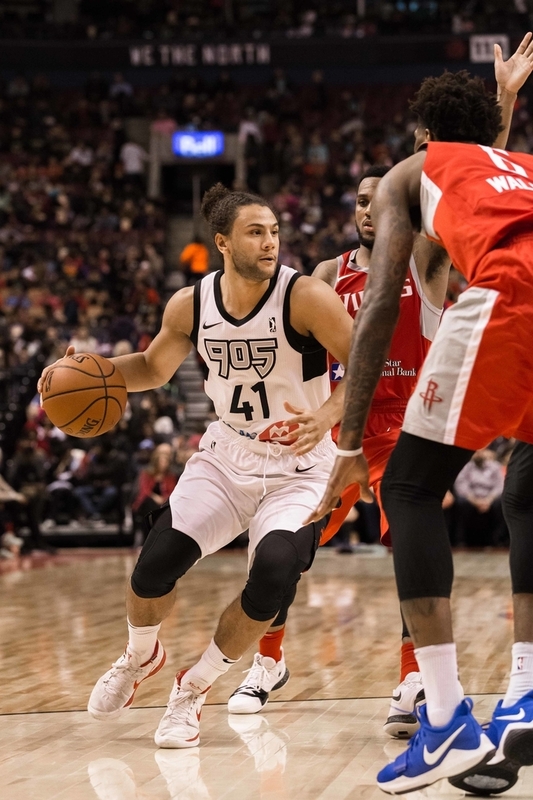 The 905 still were up 84-75 but Caboclo picked up his fourth foul and the Legends scored the last eight points of the quarter, capped off by a buzzer beating triple from J.J. Avila as the 905 held a slim 84-83 lead heading into the final frame. Caboclo scored 13 in the quarter while Miller had seven in the frame. Keane had six assists in the quarter alone. The Legends continued their run from the end of the third quarter as a floater from Ashley and a triple from Bryson Fonville gave Texas a 88-84 lead but the 905 responded with a 8-0 run, taking the lead for good. A pair of free throws from Warney cut the 905 lead to 94-92 before a lob from Keane to Best sparked a 17-8 run to close out the game. Fuquan Edwin made his 905 debut and finished with seven points off the bench. The signing of Edwin, however, led to the 905 making a tough decision, waiving Canadian Richard Amardi. This was tough to hear as Amardi was someone who was easy to root for, when hearing about his journey. 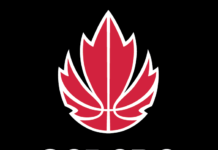 Playing in the NBL Canada for the past three seasons prior to that, the Oregon alumni made the 905 roster as a local tryout player. In 12 games, Amardi averaged 5.5 ppg. and 2.8 rpg., shooting 42.6 per cent from the field in 15 mpg, providing the 905 with a spark and great energy off of the bench. On Point wishes Amardi the best as he continues his basketball journey. From what he’s had to endure, it shouldn’t be long before he finds another home. The next home game for the 905 will be on Monday Dec. 18 at 7:00pm at the Hershey Centre against the Salt Lake City Stars.